Model, styling and make up: Ellie Connor-PhillipsI don’t quite remember how I discovered Ellie, but as soon as I saw her unique style that fits her perfectly, similar things we both like and of course her cute freckled looks (it’s no surprise for anyone that I love redheads! ;D) I knew I have to shoot with her at some point. And an opportunity came really soon, when Miss Robin announced their Postcards theme and it all just fell into place. 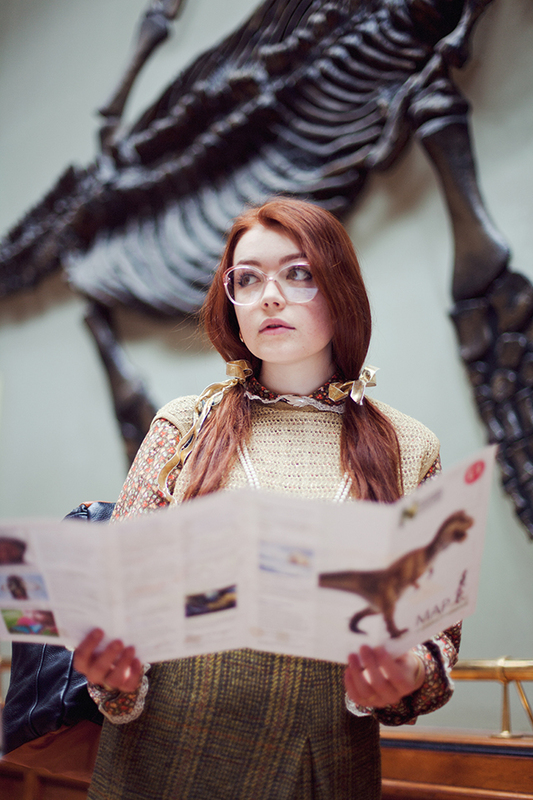 I wanted to shoot something in some natural history museum for aaages, but always felt that my ideas for it were not quite there yet, so when Ellie, tourist/postcard/vintage theme came together it all seemed quite perfect. Museum works really well for a tourist inspired story, but I didn’t want to leave it at just that, as I remembered how I felt when I came there first – it was so beautiful and breathtaking, closest to Hogwarts than anything I’ve seen, so I decided to include a magical aspect too and show that even girls that do seemingly regular things (like going candy shopping, to the bookstore or visiting a museum) might feel like they’re actually navigating a world of enchantment and hide secret magic in them that breaks through. Another blog post coming soon with lots of film+instax images from this shoot as the story now is not fully complete. Doesn’t she totally look like redhead Elle Fanning in the one below? Wow!! All these pictures of this beautiful redhead girl are fabulous. Her hair color is really suits her personality. My little daughter has redhead. She looks so cute in that. Well dear thanks a lot for these great pictures! !